Breast Cancer affects both men and women and 26 October is Breast Cancer day. The Pink Ribbon symbolises support for Breast Cancer research, and I would urge you to show your support for Breast Cancer day by making a donation and wearing a Pink Ribbon to show your support. 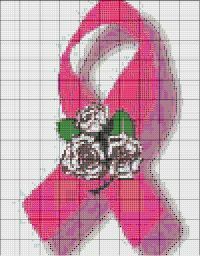 This free pattern is a Pink Ribbon motif that would be great stitched as part of a motif sampler or could be stitched on a handkerchief or just made into an embroidered badge to wear to show your support. The picture below is a small version of the chart. To download, I suggest you right click on the picture and choose “open in new tab” or “open in new window” (that way you won’t leave this article page) and then save the picture that opens. Alternatively, use this link to download the PC Stitch version of the pattern. To download the pattern, right click on the link and choose "save target as" and save to your PC. A free PC Stitch pattern reader can be downloaded here.